According to BIS Research analysis, the global mobile robot market generated $4.03 billion in 2018 and is estimated to grow at a CAGR of 19.67% during the forecast period, 2018-2023. The global mobile robot market is expected to witness a high growth rate owing to the increased need for organizational efficiency and accuracy, rising labor cost, unavailability of skilled labor, and progress in both software, including cognitive technologies, and hardware, particularly sensors, actuators, and batteries. Moreover, the increase in demand for mobile robots across sectors, such as healthcare, food and beverage, banking, and retail is another major factor behind the growth of the global mobile robot market. The increased adoption rate can be attributed to the rapid technological advancements taking place in the field of mobile robotics. According to BIS Research analysis, the global mobile robot market generated $4.03 billion in 2018 and is estimated to grow at a CAGR of 19.67% during the forecast period, 2018-2023. Asia-Pacific is expected to showcase the highest growth rate during the forecast period. • This report identifies the global mobile robot market under different segments such as types, industries, and region. • It examines the prime supply and demand-side factors that affect the growth of the market and the current and future trends, market drivers, opportunities, and challenges prevalent in the global mobile robot market. • The report also highlights the supply chain of the industry. • This report includes a detailed competitive analysis, which focuses on the ¬key market developments and strategies followed by the top players in the market. • The market for different types of mobile robots such as automated guided vehicle (AGV), autonomous mobile robot (AMR), and unmanned ground vehicle (UGV) has been estimated and analyzed. • The global mobile robot market has been analyzed in the study for major regions including North America, Europe, Asia-Pacific, and Rest-of-the-World. • The study provides a detailed analysis of 20 key players in the global mobile robot market in the company profiles section, including Aethon Inc., Aubo Robotics, Clearpath Robotics Inc., Daifuku Co., Ltd, Fetch Robotics, Inc., General Dynamics, Israel Aerospace Industries (IAI), John Bean Technologies (JBT Corporation), KION Group, Lockheed Martin, Locus Robotics, Mobile Industrial Robots (MiR), Northrop Grumman Corporation, Omron Adept Technology, Oshkosh Corporation, Rocla Oy, Seegrid Corporation, Swisslog Holding AG, Transbotics Corporation, and QinetiQ Group. This section covers company snapshots, key products and services, major developments, and individual SWOT analysis. Over the past few decades, there has been intensifying interest in robotics, both in the media and on the conference circuit. Advances in robotics, artificial intelligence, and machine learning are ushering in a new age of automation in which robots can not only perform a range of routine physical work activities more cheaply and better than humans but are also increasingly capable of accomplishing activities that include cognitive capabilities. Recently, a great deal of current research has been focused on mobile robots which can be stated from the fact that almost every major university has one or more labs that focus on mobile robot research. Today, positive impacts of mobile robotic technology are prominent across a wide range of applications in various sectors including automotive, logistics and distribution, food and beverage, healthcare, defense and security, and commercial, among others. Rapid technological advancements in mobile robots like enhanced localization, capability of mapping and prediction, and tracking features has resulted in significant increase in their adoption rate in developing as well as developed countries. 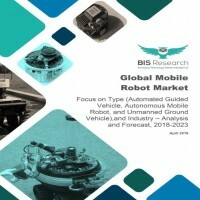 The global mobile robot market witnessed a high growth rate owing to the increased need for organizational efficiency and accuracy, rising labor cost and unavailability of skilled labor, and progress in both software, including cognitive technologies, and hardware, particularly sensors, actuators, and batteries. Moreover, as the technology became affordable due to decreasing robot cost, it is likely that the companies already using robots will use even more of them. However, considerable amount of work still needs to be done so that the mobile robots could operate in environments that are unmapped and poorly understood. Acceleration in venture capital investment for robotics technologies and the introduction of Industry 4.0 across multiple sectors are some of the major factors expected to create lucrative opportunities for the global mobile robot market in the coming five years. Some of the key players in the global mobile robot market include Aethon Inc., Aubo Robotics, Clearpath Robotics Inc., Daifuku Co., Ltd, Fetch Robotics, Inc., General Dynamics, Israel Aerospace Industries (IAI), John Bean Technologies (JBT Corporation), KION Group, Lockheed Martin, Locus Robotics, Mobile Industrial Robots (MiR), Northrop Grumman Corporation, Omron Adept Technology, Oshkosh Corporation, Rocla Oy, Seegrid Corporation, Swisslog Holding AG, Transbotics Corporation, and QinetiQ Group. At the same time, several startup companies have ventured into the market to provide solutions for varied application areas including healthcare, automotive, logistics and distribution, and food and beverage, among others. In terms of value, the global mobile robot market accounted for $4.03 billion in the year 2018 and is expected to grow at a significant CAGR during the forecast period 2018-2023. The global mobile robot market has been segmented into three types: automated guided vehicle, autonomous mobile robot, and unmanned ground vehicle. The automated guided vehicles acquired the largest share in 2018 since they can be deployed in a broader range of industries and have high demand across regions like North America and Europe. However, the autonomous mobile robot market is expected to grow at the highest CAGR during the forecast period 2018-2023. North America accounted for the highest share of the market in 2018 owing to the maximum number of mobile robot companies present in the region. However, Asia-Pacific is expected to witness the highest growth during the forecast period, mainly driven by the increasing focus of nations such as Japan, China, India, and South Korea. The high growth rate in the Asia-Pacific market is mainly due to the increased demand from small and medium businesses that form an essential part of the Asian economy and growth in logistics and distribution industry.